Today marks the two month anniversary since the death of our friend, ally, and confidante, Kevin, the omnipotent cuboid who once gracefully roamed across the plains of Fortnite: Battle Royale's ever evolving map. 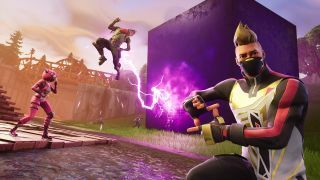 After rolling around the PvP arena throughout Fortnite Season 5, zapping anyone who pissed him off, Kevin succumbed to an unknown fate during one of the game's biggest live events so far, seemingly disappearing into the ether without so much as a fond farewell. In case you just failed the easiest Where's Wally? challenge ever, Kevin can be seen towering behind the player in the distance, sat between the two central pylon structures and slightly obscured by a layer of wintery mist for extra dramatic impact. With this sudden appearance, players are already anticipating Kevin to make his grand comeback to the Fortnite map in full, but it could be some time before that happens. Epic always enjoys teasing future developments long before they come to fruition, and we can't write off the possibility that this is just a nice little callback to a fan favourite Fortnite moment. Either way, this Easter egg, alongside the appearance of actual Fortnite dragon eggs, suggests big things are in store for the most popular game on Earth right now, so stay tuned to GamesRadar+ for all the latest Fortnite news as it arrives. For the best games like Fortnite to turn to when Epic unplug the servers, look no further than our ultimate battle royale guide.